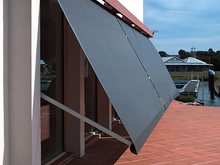 Very popular in the summer are folding arm awnings from Goldfields Screens and Blinds in Maryborough. 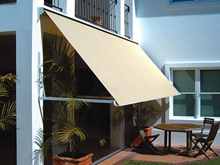 Folding arm awnings create shade over your terrace, patio or courtyard. They can be operated by a crank handle or by a motorised system. 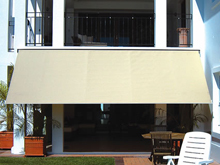 Folding arm awnings can be part or fully extended which allows you to increase the size of your entertainment area. We are excited to introduce these innovative new awnings – the iShade Sundance Retractable Folding Arm. The iShade’s high quality folding arm system with its simple, reliable operation allows you to extend your living or entertainment area with a fabric roof. Its slimline headbox gives the awning a neat, compact appearance when tucked away and prolongs the life of the fabric. 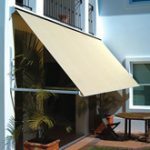 Ideal for small balconies or large courtyards the iShade retractable folding arm awning provides protection from harmful UV rays, glare and the sun’s intense heat. 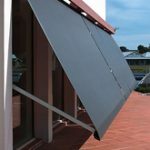 Contact us for a free quote on folding arm awnings and retractable folding arm awnings in Bendigo, Castlemaine, Daylesford, Daisy Hill, Ballarat or Goldfields Victoria. 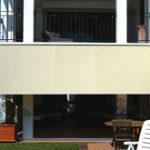 Ask us about our other alternatives for awnings, we are happy to give you a demonstration.